Read COSMOPOLITAN from cover to cover. Two mental health articles. I must write one about a college girl suicide. THE DAY I DIED. And a story, a novel even. Must get out SNAKE PIT. There is an increasing market for mental-hospital stuff. I am a fool if I don't relive it, recreate it" (495). Well, Plath was no fool. 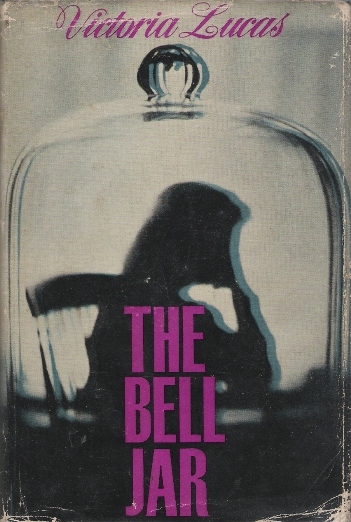 Published on 14 January 1963, Sylvia Plath's novel The Bell Jar was the third in an unrelated trilogy of novels set in mental hospitals to appear in print in three years. British author Jennifer Dawson's The Ha-Ha came first, published in early 1961. 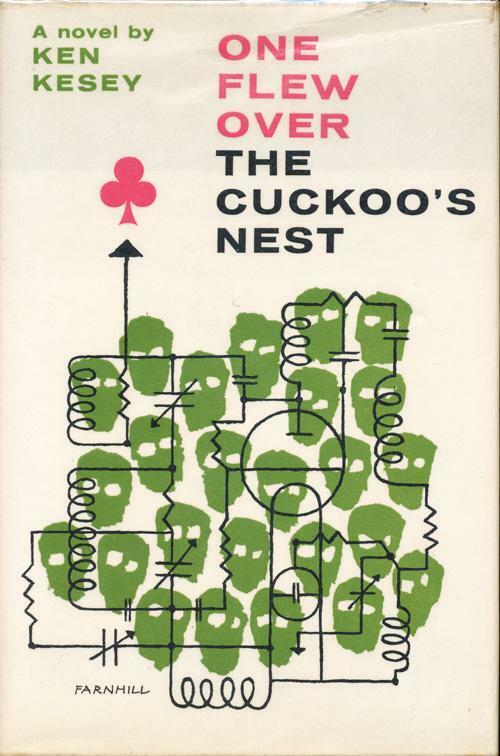 Then came the American writer Ken Kesey's One Flew Over the Cuckoo's Nest, published in the United States in February 1962 (and in the United Kingdom in January or February 1963). The connections between these authors and their books is most interesting. Three writers separated by continents and countries and experiences all exploring quite similar material though in very different ways. As stated above, Plath's journal entry comes on the heels of her reading articles in a contemporary issue of Cosmopolitan. The two "mental health articles" were: "Psychiatry and beauty" by Eugene D. Fleming (June 1959: 31-36) and "'I Was Afraid to Be a Woman'" by Patricia Blake (June 1959: 56-61). These articles were mentioned and discussed previously in works by Luke Ferretter and Brittney Moraski. In November 1961, Plath received a Eugene F Saxton grant for her novel which by that point was largely done. An article appeared in The New York Times about this ("Fellowship for Poet" on 21 November 1961: 36). Nearly two years before, on 22 January 1960, an announcement was made that Ken Kesey was also the recipient of the Eugene F Saxton grant (24). The articles revealed no details of the subject of the novels. Plath's novel was written in the spring of 1961 -- after Dawson's novel was out but before Kesey's was published. It is unknown if Plath knew much about either novelist. There might be some mention of this in her journals for this period (which are missing). But no known reference otherwise exists that mentions these authors. In Giving Up (2002), Jillian Becker reports that Dawson's novel was one of the items she was to fetch for Plath when she was staying with them from 7-10 February 1963. This same issue of The Observer printed three poems by Ted Hughes: "Water", "New Moon in January", and "Dark Women" (later titled "The Green Wolf"). Going back a few months, The Ha-Ha was mentioned in the "Paperbacks in Brief" section of the 24 June 1962 issue of The Observer: "Jennifer Dawson's highly original novel of life in a mental hospital" (25). When published in the United States in 1962, Kesey's novel was scarcely reviewed in some of the likely sources Plath would have had access to from England. The New York Times reviewed One Flew Over the Cuckoo's Nest on 4 February 1962. It was also reviewed in Time on 16 February 1962. Plath may have seen the "Briefly Noted: Fiction" mention in The New Yorker on 21 April 1962. In England, the TLS mentioned the forthcoming novel in England in their 10 August 1962 issue. A notice also appeared in the 1962 Cheltenham Festival of Literature program which published Plath's prize winning poem "Insomniac". The notice reads; "Ken Kesey has written an exciting and very human first novel set in a mental home". However, the majority of reviews or mentions of the novel appeared in the days and weeks after Plath's death (reviews in The Times on 21 February 1963 by Anthony Burgess in The Guardian and Julian Jebb in The Times on 24 February 1963). Burgess, you may recall, reviewed The Bell Jar in The Observer on 27 January 1963. The most interesting review, perhaps, appeared on pages 116-120 of the Spring 1963 issue of Northwest Review: "Review of One Flew Over the Cuckoo's Nest" by R.L. Sassoon (that's right, Richard Sassoon). The three novels have an interesting and connected history, no?, Read together, they tell of a frightening reality in mental health care during the 1950s and early 1960s. Kesey's treatment of ECT is horrifying and I felt I learned some insight into the treatment Plath received during her Bell Jar summer of 1953. Sylvia Plath kept a daily diary for several years starting in 1944. I recently worked with her diaries for the first time, delving deeply into them looking for contextual and other reference information to try to improve notes on the letters for that period. On 30 August 1945, Sylvia Plath wrote in her diary about a day spent she and Warren had, from the dentist in Boston and out for lunch in Sudbury, Massachusetts. 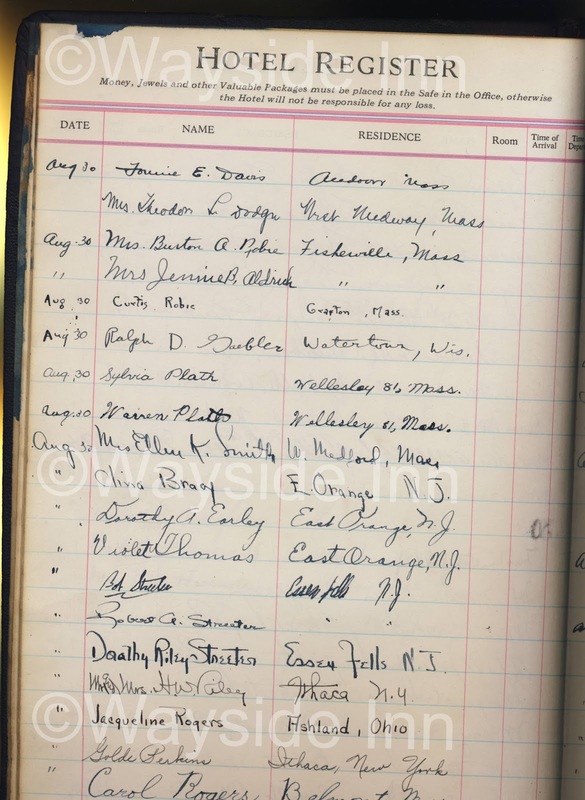 Plath's dentist was Howard C. Reith, a Winthrop, Massachusetts resident. According to the Boston city directory, his office was located at 370 Commonwealth Avenue, Boston (map), which is now the location of the Eliot Hotel at the corner of Commonwealth and Massachusetts Avenues. The trip to Sudbury was made with Ralph Gaebler, his brother Max, and Max's wife Carolyn. Plath commented on Ralph's driving (fast). They at at the famous Wayside Inn (map). The inn began serving travelers in 1716. In 1862 the poet Henry Wadsworth Longfellow visited, later publishing a book of poems, Tales of a Wayside Inn, among those including "Paul Revere's Ride", spoofed above. Plath gorged on crackers, sausages, pineapple, potatoes, squash, lettuce, carrots, rolls, and ice cream, among other things. After the meal, the group took a tour of the site. Plath comments on the old fashioned rooms and the name plates of the famous historical visitors. She also commented that she signed the register book. Interested about this, I contacted the Wayside to see if they had in their archives the old guest books. I was both happy and surprised to receive back an email from their archivist Roberta with an attachment! It is with their permission that I reproduce the page featuring the signature of Plath, her brother Warren, and Ralph Gaebler below. 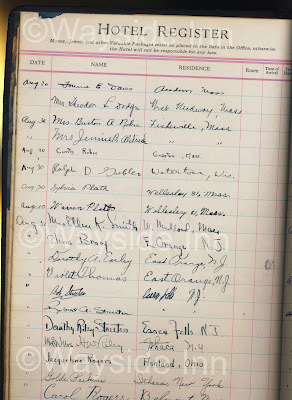 Plath and her brother gave their residence as "Wellesley 81, Mass.". The "81" is the old two digit zip code for their part of Wellesley (Wellesley Hills) which was implemented circa 1943.The zip was expanded to a five digit code, 02481, on 1 July 1963, just a few months after Plath's death. All links accessed 21 December 2015 and 1 January 2016.